Hawaii is, of course, one of the prime centers for volcano eruptions, as is apparently happening on Honolulu right now. The volcano Kilauea has been steadily flowing lava since 1983, and over time it has destroyed almost 200 homes in the area. Usually the lava and the people choosing to live on the volcano have an okay relationship, with the lava flowing in directions that don’t threaten the small communities nearby. However, every so often it changes its mind and begins edging in on the towns. 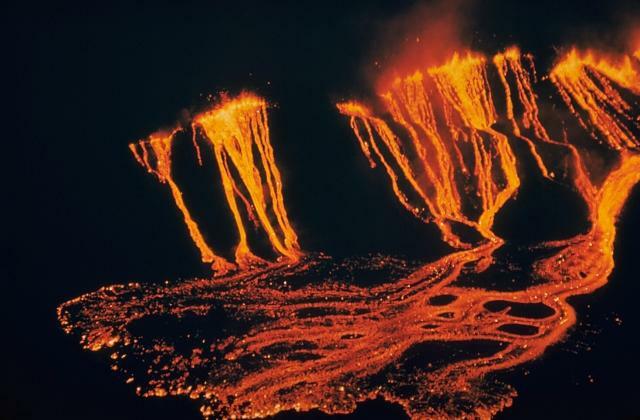 Currently, the Kaohe Homesteads are threatened by the lava flow’s direction. It is believed that the lava may reach the homestead within a week, while crossing a road that would limit rescue capabilities. Given the fact that everyone living or working in the district lives in these homestead, that could be a fairly significant threat. The state is looking into means that might possibly divert the flow of lava in a different direction to save the homes, thus avoiding the issue from the 90s where 200 homes were destroyed in one small village. Kilauea the home of Pele, the ancient volcano goddess (or so the local Hawaiian tribes have long believed). This makes it a central place of worship, with many locals of the opinion that the volcano’s behavior reflects a message from the goddesses herself. They are now arguing that to divert the flow of lava would be to interfere with the goddess and their religious faith. The accusations suggest that by diverting the flow, the state is being culturally insensitive to the native Hawaiians who still believe in Pele and that her mountain should be left alone. They also argue that those people living on the volcano have undertaken this threat (that the state will honor the culture instead of human livelihoods) as part of the risks of living there. That the locals either are part of the Pele believers or knew about the belief when they settled. Almost all of the homesteaders are people who have chosen to live off the grid in a far more rural and wild part of Hawaii than the cities. They usually have to agree to very strict rules about assumption of risk when they get insurance for their property due to this very risk of damage caused by living on the volcano. It’s not like this volcano only randomly erupts every 500 years or so ~ the religion and the volcano’s eruptions have been going on a very long while. Should the state make the decision to potentially save the homes and lives of people in the homestead by altering the course of the lava flow or should it honor the cultural and religious traditions of the area by letting the volcano do as it wills? Especially if there are people in the homesteads who believe that the culture is more important than their homes? Hurricanes are a way in which the local gods communicate their displeasure with a certain community or region. Living in an area frequently affected by hurricanes means you accept the local belief and should honor the local cultural point of view. Thus the state should not build levees or undertake protective measures to shelter the towns from hurricanes. The result here being that most of the shoreline from New York to Texas should never be settled if you want your home to survive Hurricane season. If we then also applied this to tornado areas and forest fire areas and, and, and, the entire greater US would be uninhabitable. What do you think? Should culture win out in this situation? I’ve got mixed feelings so I’m open to your thoughts!